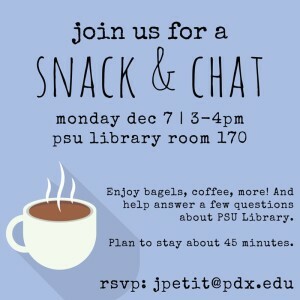 Join Portland State librarians for a study break with snacks and a chance to chat with some librarians about PSU Library. We want to find out what you think about PSU Library — your favorite places to study and what we could improve — and we also want to learn more about how we could better communicate with PSU students. We ask you to commit to joining us for at least 45 minutes. Questions? Want to RSVP? Check out the event on Facebook or contact Librarian Joan Petit.